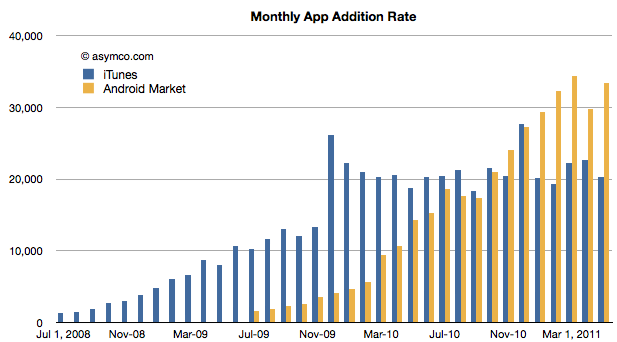 According to 148apps.biz, the App Store has seen over half a million apps since inception. The number of available apps, according to Apple, is now 425k. (148apps claims 402k apps available in the US store.) 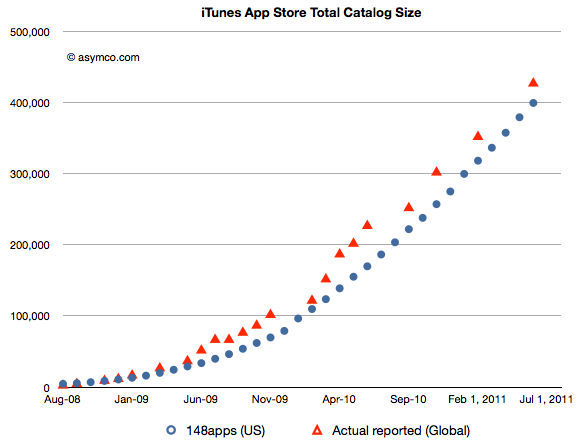 The history of the App store catalog is shown in the following chart (showing both US and World-wide measures). In an interesting new post by Appsfire, APPtrition – or why app store size does not matter that much… Ouriel Ohayon makes a good point: available is very different than accepted. When comparing catalogs it’s important to distinguish between these measures. Apps are published and then unpublished for various reasons. 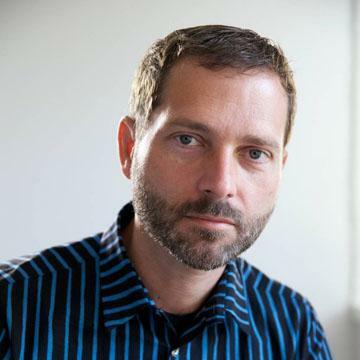 He calls this app attrition and details the reasons it might happen. This data would indicate that the iTunes App Store has plateaued at about 20k apps per month while Android is still growing and adding at about 30k per month. The challenge for an observer is to reconcile the growth in Android submissions with the apparently far higher attrition rate. In other words, Android developers and producers seem to be more prolific but less persistent. With few if any constraints on submission it’s understandable that there will be more apps thrown into the catalog. But why would they be so rapidly removed remains a mystery. Maybe economics, maybe policing, maybe something else altogether explains this.